Geek style stickers for your laptop. 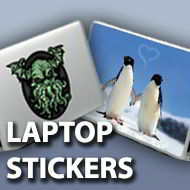 Here you will find all of our geeky laptop stickers. We have science stickers, funny stickers, sci fi stickers, fantasy stickers, TV stickers, movie stickers, artistic stickers and MORE. We have Cthulhu stickers and others based on HP Lovecraft stories, War Of The Worlds stickers based on vintage artwork for the classic HG Wells novel, and your favourite science designs, such as Schrodingers Cat stickers, Pavlov's Dog stickers, periodic table of elements stickers and CERN stickers. We also have artistic laptop stickers like the Colourful Planet Earth sticker and Caravaggio Medusa sticker, funny stickers like the Hal-O Kitty sticker and YouNoob sticker, and cute stickers like the Penguins In Love sticker and OMG Comfortable Branch Panda sticker. So, if you're looking for your favourite Something Geeky designs on a sticker but you don't see it here, contact us via our contact form or our Facebook page, and we'll do our best to accommodate!